With first-place in the Pacific Division hanging in the balance, the Roadrunners’ power play pummeled its way through the second period of Wednesday night’s contest, leading the club to a 4-1 victory over the Stockton Heat at Stockton Arena. Following a rather trying opening frame in which the Roadrunners were outshot 15-8 and handed an early one-goal deficit by way of a Ryan Lomberg goal seven minutes in, the team responded by taking full advantage of – yes - their man advantage. Tucson’s power play made Stockton pay, indeed. 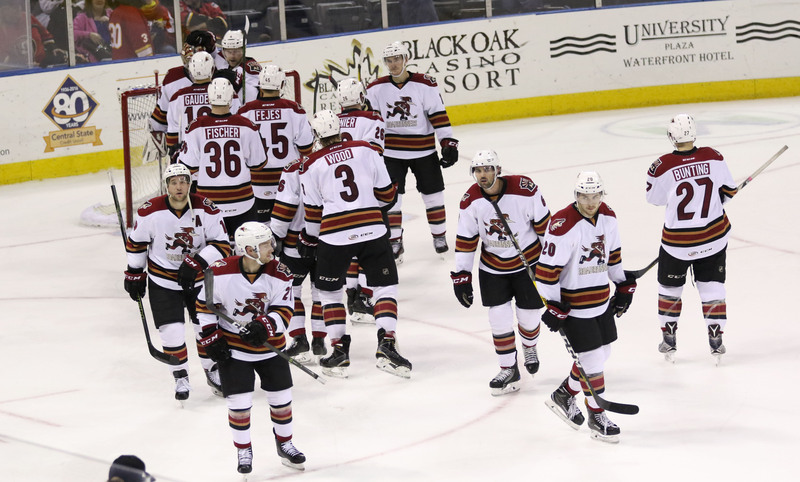 Three power play goals in a 3:55 minute span, including a pair from Laurent Dauphin 1:19 apart completely upended any momentum Stockton built in the first period, giving the Roadrunners the fuel they needed to ride into their fourth-straight victory. With just over 12 minutes to play in the second, Christian Fischer buried a Jamie McBain feed to put the Roadrunners on the board, extending his point-streak to seven games. Kyle Wood, with the assist on Fischer’s tally, also extended his point-streak to seven games. On Tucson’s ensuing power play, Laurent Dauphin, while stationed atop Jon Gillies crease, got a piece of a Kyle Wood shot that barely scoured its way over the goal-line. Just over a minute later, and with a little over eight minutes left in the second, Laurent Dauphin finished the work on a gorgeous tic-tac-toe sequence that included work from the likes of Christian Fischer and Chris Mueller to give the Roadrunners a 3-1 lead. Mueller’s assist on Dauphin’s second goal extended his personal point-streak to four games. Dauphin’s two goals Wednesday night now give him 10 points (5G, 5A) in seven games played with Tucson. Ryan MacInnis capped off the scoring during the opening moments of the third period when he buried a Conor Garland pass while evading defensive attention in front of Jon Gillies’ net. Marek Langhamer, after allowing an early goal on a fumbled rebound, played a very fine game, making 35 saves to earn his fourth win of the season, and his third against Stockton. With 8:20 minutes left to play in regulation, a scrum in front of the teams’ benches saw a combined 134 penalty minutes assessed. The win, giving the Roadrunners a 15-6-3-0 record with a .688 win percentage, keeps the club atop the Pacific Division. The first-place storyline was indeed on the minds of the coaching staff and players before, during, and after Wednesday night’s contest. Christian Fischer (1G, 2A) led all Roadrunners players in points scored (3), Laurent Dauphin in shots taken (5). Marek Langhamer made 35 saves in the win. 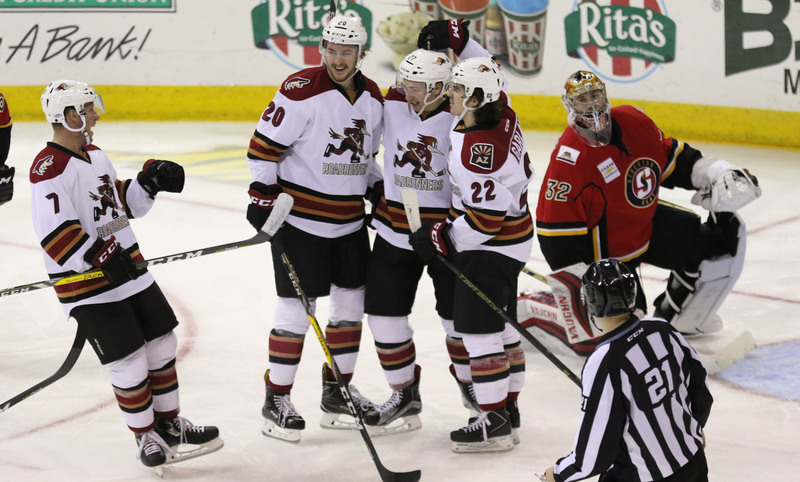 The team now returns home for a pair of games against the San Antonio Rampage this Friday and Saturday night at Tucson Arena. Friday night features ‘Star Wars Night’, while Saturday – New Year’s Eve – features $1 concessions and an early start time of 6:05 PM MST. Be there to see the first-place Roadrunners for two more games before 2017!